Alex Trujillo in Avon (David O. Williams photo). Congress is deadlocked once again on a permanent solution for Dreamers — young people who were brought to the country illegally by their parents at a very early age and now face deportation after the Trump administration moved to end the Deferred Action for Childhood Arrivals (DACA) program. Colorado Sens. Michael Bennet and Cory Gardner are bipartisan cosponsors of the Senate version of the Dream Act that would essentially codify into law the DACA program that allows the Dreamers to register with the federal government and then work and study legally in the only country they’ve ever known. Both senators are also members of the so-called “Gang of Six” working on a bipartisan deal. 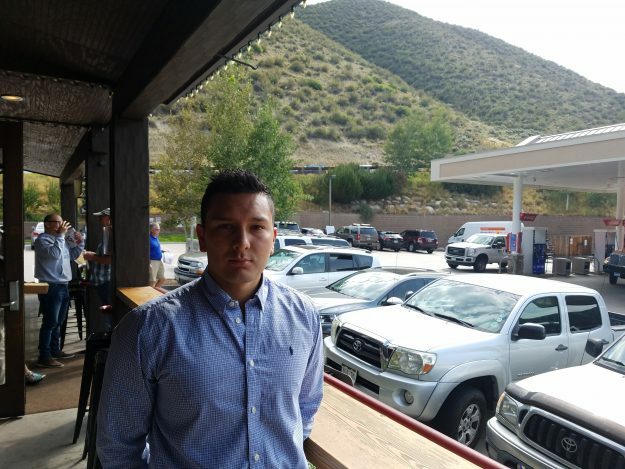 Real Vail has interviewed numerous productive and law-abiding DACA recipients who are contributing to local economies in numerous ways, including former Eagle County, Colo., resident Alex Trujillo — a graduate of Colorado Mesa University in Grand Junction. The DACA debate has become entangled in a political battle over a spending bill to fund the federal government beyond Friday’s deadline. A House continuing resolution includes six years of funding for the expired children’s health insurance program, or CHIP, but does not deal with DACA. That four-week proposal is drawing heat from both the right and the left, and the White House on Thursday apparently shot that deal down when Trump tweeted CHIP should be taken out of any short-term spending fix (although the House later passed the continuing resolution). Democrats want CHIP renewed and don’t want increased immigration enforcement funds to be used to deport Dreamers, while Republicans want DACA included in a more sweeping immigration bill that would roll back visa programs and provide money for a border wall that President Donald Trump promised voters. A bipartisan compromise bill was rejected by the president last week at a meeting in which he reportedly called Haiti, El Salvador and African nations “shithole countries” while saying he prefers people from Norway. Republican congressional leaders blame the looming government shutdown on Democrats, saying there is no urgency for Dreamers until the entire program expires March 5. But advocacy groups contend DACA recipients are losing protections on a daily basis and now face deportation from stepped-up interior immigration enforcement. Colorado Gov. John Hickenlooper and Ohio Gov. John Kasich on Thursday signed and sent a letter urging Congress to pass long-term funding for CHIP and a permanent solution for DACA recipients. Read the letter here. In the House, U.S. Rep. Jared Polis, a Boulder Democrat who represents Vail and part of surrounding Eagle County in Congress, this week introduced yet another bill aimed at solving the DACA situation, which the vast majority of Americans think should be resolved by Congress in a bipartisan manner. Washington: Rep. Jared Polis, D-Colo., sponsored the Uniting and Securing America (USA) Act today, alongside dozens of other members of Congress, Republicans and Democrats. The USA Act, heralded as the bipartisan compromise for dreamers, moves forward the principles behind the Dream Act, providing a mechanism for young dreamers to attain legal residency for up to eight years. “The situation for dreamers is desperate and urgent, and requires Congress to set aside political games and collaborate now. From the beginning, I have advocated for passage of the Dream Act – even offering the bill as an amendment twice – and I am confident that the bipartisan USA Act will deliver robust protections for dreamers. We can’t wait any longer. Since the President dismantled the Deferred Action for Childhood Arrivals (DACA) program, over 15,000 dreamers have already lost their protections from deportation. The deadline for action is now so that the Dept. of Homeland Security has the time necessary to create and implement a new program before March 6,” said Polis. The USA Act provides a temporary, but long-term, solution for young people, below the age of 18, who resided in the U.S. on Dec. 31, 2013 or before then. It also addresses the backlog in immigration courts by allowing 55 immigration judges to be added to the system each year for the next three years. Finally, it incorporates a border security plan that uses technology at the boarder to stop illegal crossings, as opposed to the gimmicky “border wall” plan presented by President Trump. Since the announcement that the Trump administration will terminate DACA, Polis has been exhausting every option possible to find a fix that is as expansive and inclusive of as many dreamers as possible. He is a sponsor of the Dream Act, H.R. 3440; BRIDGE Act, H.R.496; American Hope Act of 2017, H.R.3591; ENLIST Act, H.R. 60. He participates in a taskforce on immigration with the bipartisan Congressional Problem Solvers Caucus, and has been actively collaborating with the Congressional Hispanic Caucus. Polis has been a consummate champion for fixing our broken immigration system to align with American values since joining Congress. In October 2013, he introduced the Border Security, Economic Opportunity, and Immigration Modernization Act, a bill that would have improved national security, streamlined our country’s guest worker system, and created a pathway to citizenship for millions of undocumented individuals. The Congressional Budget Office estimated that the bill would have reduced the deficit by nearly $200 billion over ten years. The Senate companion of this landmark bill passed in June 2013 and was widely heralded as one of the most significant attempts at comprehensive immigration reform in decades. He is also the co-chair of the Congressional Mexico Friendship Caucus. Prior to serving in Congress, Polis founded The New America School – a network of charter schools in several states serving new immigrants and English-language learners.